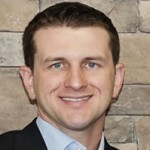 Mark Watson is co-owner of Exterior Medics, an exterior home improvement company in Northern Virginia. Although British, he is not related to Emma Watson. Mark is proud to have achieved becoming a two time Qualified Remodeler 500 List winner and a winner of the 2014 Guildmaster Award for outstanding service and customer support. To get in touch with Mark or for more information on Exterior Medics, please visit www.exteriormedics.com . If you think doors are all about function and less about form, think again. Doors can easily impact your curb appeal and add character to your home. When it comes to your entry doors, you shouldn’t settle for the “just another door” look. Here are five of the hottest door trends you can apply to your entry door to have an entry door that is not only functional but also decorative, and add a refreshing look to your home exterior. Move over iron and steel doors, natural tinted wooden doors are making a grand comeback. As general home improvement trends head towards a more eco-friendly direction, wood is all the rave. Distressed antique custom doors, deep mahogany-varnished and naturally tinted oak doors are flying off the shelves. The nod to eco-friendliness and the glory of the natural past is not without a touch of the modern sleek technology. Wooden doors are now made with stronger moisture-resistant panels and rot-resistant coatings. These wooden doors are even more customizable thanks to modern manufacturing technology, and will surely reflect your unique style preference. Glass doors are also trending, particularly the craftsman or prairie style inspired look which is a nod to both glass and wooden elements. Another popular choice when it comes to glass doors are glass door panels crafted with artistic customizable geometric patterns and color schemes. Like wood, glass door manufacturing technology had made significant strides in the past, resulting in a much more formidable selection of glass doors. Insulated glass units are now multi-glazed and airtight, preventing drafts and leaks. For a modern look, sandblasted glass doors are the choice of homeowners, while beveled glass is chosen for a more elegant look. 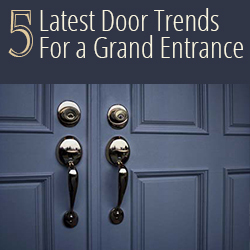 Height and width seems to another hot trend this year for entry doors. Homeowners are choosing eight-foot doors as ceiling height trend is also taking a turn towards a similar direction. Tall doors add an immediate dramatic effect to any home and creates an illusion of increased interior space. Another one of this year’s popular door trends is making it a centerpiece to highlight a home’s exterior color scheme. Bring out a pop of color to your home exterior by picking an eye-catching door color that matches the color of your trims, railings, roofing tiles or chimney. Doing so immediately adds character to your home. Installing designer door accents and surrounds is one of the hottest trending door updates of the year. Designer door accents not only adds character to your entryway, but is also an easy way to improve your curb appeal. Choose from pediment sets, door pilasters, door mantels and overlays, keystones, and dentil strips. 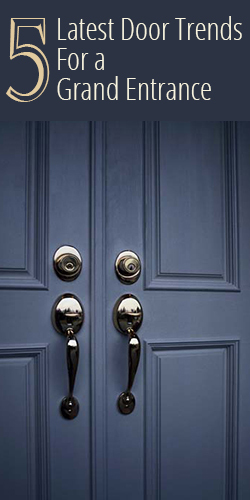 These door accents can be purchased in different colors from door distributors, and can easily be installed with the help of your local exterior home improvement experts. Choose a door surround system that suits the architectural style of your home and your personal taste. Your entry door is one of the first things people see upon visiting or passing by your home. While it is important that you pick a door that can serve its function and protect your home from elements and intruders, you do not have to sacrifice style. The latest doors are reinforced with modern materials that make them sturdy and reliable. Most modern doors are also customizable, giving you control over the style and function aspect of your door. With the right door style, you’re sure to make an impressive first impression with both guests and passers by.